Cajun Music Radio is excited to announce that we have partnered with the CFMA Lafayette Chapter to promote the upcoming “Cruising with the Cajuns” Caribbean cruise featuring Jr. Hebert and Jackie Callier. 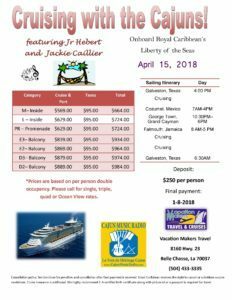 This exciting adventure will depart form Galveston, TX on April 15, 2018 sailing to Cozumel, The Cayman’s, and Jamaica. Join your fellow Cajuns for night after night of dancing to traditional Cajun French music, unlimited gourmet food, and the magnificent scenery aboard Royal Caribbean’s Liberty of the Seas. Make sure to mention “Cruising with the Cajuns” to your travel agent. Contact Cajun Music Radio for any questions!